(803) 606-0999 Earn $$ with your referral code! Why are some of your routes Primary and others Secondary? Due to high demand and finite resources, SC Shuttle Service's primary focus at this time is the Columbia and Charlotte route. All other routes would be subject to availability. If there is a shuttle available for your scheduled travel date/time and location we will immediately make the reservation for you. How is the Extended Mileage cost calculated? In order to recover fuel costs and employee overtime, we charge a small pickup fee based on the excess mileage to/from your location to each terminal. The excess miles is the difference between your trip and the base mileage already included in the fare. The rate for the extra mileage is listed in the Additional Charges table on the reservation page. The calculation is simply the extra mileage X the rate. How do you determine my pick-up time? For domestic travel, it's calculated with shuttle ride time to get you at least 60 - 90 mins prior to your scheduled departure. For international flights it will be 120 mins. With airline travel, we'll track your flight with live flight data. Pick-up from the airport or cruise terminal is based on your flight/cruise itinerary. You will go from baggage claim directly to the van. With drop-off at the airport or cruise terminal, your pick-up time will be determined by your pick-up location (Home/Office/Hotel) and your flight/cruise departure time. This is generally 90 mins for CAE and 3 hours prior for all others. Any shuttle ride beyond our advertised hours of service or location, will be charged a reasonable fee. This enables us to accommodate our passenger's needs, which may occasionally be outside of our normal hours of operation (6am-10pm) and/or service area. The fee for an extended hours trip is $25 and mileage outside our base miles are calculated at a small flat per mile rate. All fees are used to cover the costs for additional mileage, fuel and driver overtime hours. You will find that even with these fees, SC Shuttle Services is still the lowest cost alternative for your airport travel. For your convenience, we offer curbside pick-up at your Home, Dorm, Business or Hotel location on all departures. For arrivals at the airport or Union Pier terminal, it will be the curbside location designated for all shuttle buses and vans. 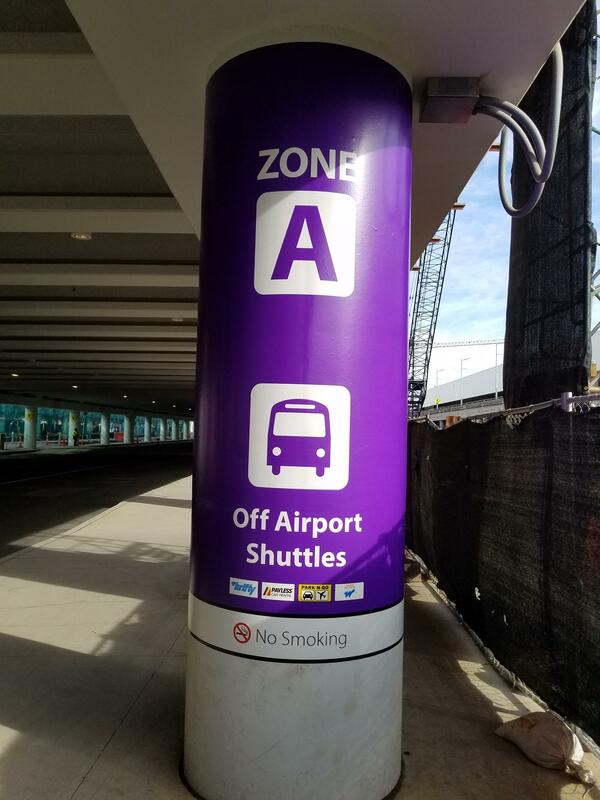 For the Charlotte airport specifically, our shuttle pickup area is at Zone A. Go through the doors at baggage claim area C, cross the street to the median and turn left and walk to the purple columns marked Zone A. Our white shuttle vans are easy to spot with clearly marked "SC Shuttle" decals. You will also receive an email or text with your driver and shuttle van picture prior to pick-up. For more pictures of our fleet of vans, check out the About page. How long do I have to wait at the airport before the Shuttle leaves? Since this is a shared ride service and not a taxi, sometimes there may be a wait for other passengers to arrive. On average, the wait time has ranged from 0 - 30 minutes. However, we promise that the maximum wait time will be no longer than 1 1/2 hrs. Why do you need my Airline Name and Flight Number? According to Bureau of Transportation Statistics only 77% of US domestic flights arrive within 15 mins of their scheduled time. The flight information you provide allows us to track your flight in real time and make accommodation for any delays or change in your flight time/status. Can I return with your service? Yes, we would be delighted to transport you on your return trip. Please select the "Round Trip Shuttle" as the Service needed on the online reservation form. Then enter your return date, time and flight information in the "Return Travel Information" section. What hours do you operate the shuttle service? We begin our shuttle service at 6:00am and our last shuttle ends at 10:00pm. For extremely delayed flights, the last shuttle will depart the terminal location no later than midnight. If your scheduled arrival time is after 10:00pm or your pick up time will be before 6:00am we can accommodate you, but there will be a $25 service charge. Passengers who miss the last shuttle of the evening will be automatically rescheduled to ride on the next available shuttle at no additional charge. Please note that there are no reservations or shuttle services available on the following dates: 4th July, 28th November, 24th, 25th, 31st December, and January 1st. Does SC Shuttle provide car seats or accommodate special needs? Yes, we do provide child seats. South Carolina state child passenger restraint laws require children 5 and under to be seated in federally approved child car seats appropriate to their weight and age. Although we do supply these depending on availability, we recommend that you travel with the appropriate car seats when possible. Unfortunately, our vans are not currently wheelchair accessible but we are working on changing that. Please note that we do not allow pets or animals on board with the exception of guide/service animals. We will do our best to accommodate all other special needs within a reasonable limit. For additional questions, please call, email or visit our Contact Us page. Can I pay with a credit card for my reservation online? Yes, we accept Visa, MasterCard, Discover and American Express online. We can also process your credit card payment over the phone and cash upon pick-up is also available if you wish. For your convenience our drivers also accept credit card and cash payments for immediate or short notice travel. Click on the Reservations button on the top navigation bar. Then fill out, review and submit your request. You will receive a confirmation email and your driver will call you by 7pm the day before your trip to confirm the details. Can I cancel or make changes to my reservation on the website? Yes! If you created your reservation while logged into this website, you will have the ability to view and change some details of your reservation up to 24hrs prior to your travel date. Of course, you can always call and speak to a live agent, email reserve@scshuttle.com or send us a message with your cancellation or change request via the Contact Us page. You must notify us immediately of any cancellations or change in your schedule. We would prefer at least a 72 hrs notice but if notified within 24 hrs of your scheduled pick up time, we will refund any charges paid. However, we will charge full fare for late cancellations (less then 24hrs) and for no shows. To confirm, cancel or modify a reservation please call us at (803) 606-0999. Do you offer discounts or reduced fare promotions? Yes! We offer 50% off the seat price for all children under 13. Also our military service members will receive a 10% discount (use code MILITARY10 with a valid Military Id) off each Adult ticket, and all registered travelers can earn a $50 credit for every 10 referrals. Please ask for more information from one of our agents or through our contact form on the website. I called and got voicemail after hours. When can I expect to be called back? You will receive a priority call back first thing when our phone lines re-open (8am - 9pm EST daily) the next day. Of course, if it's an urgent request, please indicate this in the voicemail and we will respond accordingly. Who can I call for Lost & Found? Please note that SC Shuttle is not responsible for lost stolen or damaged belongings/property. If an item is lost, please immediately call (803) 606-0999 or use the contact us page on this website. If your property is located, you may arrange a time to pick it up from an agreed location. Don’t worry, our drivers normally monitor your flight and are aware of delays. That is why we recommend specifying the flight number. The free waiting time in such a situation is 45 minutes. In other unforeseeable circumstances, please call us immediately at (803) 606-0999, and we will try to work it out. What is the Passenger Information scrolling on the reservation page? Due to high demand and finite resources, SC Shuttle Service's primary focus is the Columbia and Charlotte route. We will continue to take reservations for Charleston, Greenville–Spartanburg and Augusta airports subject to availability. Rest assured, if there is a shuttle available for your scheduled travel date/time and location we will immediately book the reservation for you. After you submit your request you will receive a confirmation email with the details including an estimated pickup or dropoff time* and the name and picture of your initial driver and shuttle van. You will receive a phone call from your driver by 7pm the day before your trip to confirm any details. *We will calculate your pickup/dropoff time based on the travel arrival/departure time you entered and existing reservations for that day. Please call us to cancel or change your reservation. Five (5) passenger limit per reservation trip made on-line. Please call and speak with our agents at (803) 606-0999 if you need transportation for a larger group, and ask about our Group Discount rate. Two (2) full sized bags per guest limit. A $25 fee will be charged for each full sized bag which exceeds this limit. Please DO NOT book on-line if you have large cardboard boxes or containers. Please call us to pre-arrange your baggage. If you need a reservation outside of our normal shuttle hours of 6am - 10pm, we can accommodate you on a case by case basis for an additional $25 fee. If you need a reservation with a pickup or dropoff location outside of our Columbia SC service area, we can accommodate you at a small per mile rate, depending on the location. Our drivers can only pick you up curbside in order to comply with our insurance requirements for safety. We require at least a 24 (72 preferable) hour notice of cancellation so that we may fill your seat. Unfortunately we do not offer refunds on cancellations less than 24 hrs prior to your pickup time. Live reservation agents are available from 8am to 9pm EST and our shuttle service runs from 6am to 10pm daily. Please note that there are no reservations or shuttle services available on the following dates: 4th July, 28th November, 24th, 25th, 31st December, and January 1st. Unfortunately our vans are not equipped to be wheelchair accessible at this time. Reasonable accommodation will be made for all special requests, but we reserve the right to refuse any request for any reason. We will provide appropriate child car seats if needed. However, we do recommend if possible that you travel with the appropriate sized child seat. Since we operate a shared-ride service, we cannot allow pets or animals on board. We do however make exceptions for trained guide/service animals. The safety and comfort of our passengers are our number one priority. We will eject or refuse to serve any unruly passenger that our trained drivers have deemed a safety risk or is being disruptive. Tipping is allowed and appreciated by our drivers. If you believe that your driver provided you with courteous and excellent service then please feel free to tip. You may also send us comments about your experience on our Contact us or Facebook page.